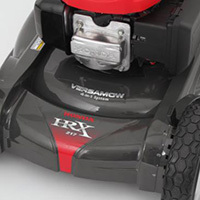 The HRX217HYU is fully Self-Propelled by Hydrostatic Cruise Control. 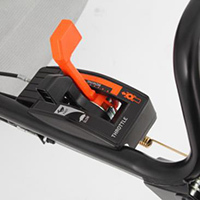 This represents simple, precise speed control that’s fully adjustable from 0-6 kp/h. You’ll save your back, shoulders and arms by letting the mower do the work for you! Featuring an incredibly tough NeXite 21” cutting deck, which is lightweight but tough enough to handle even the most trying of Australian conditions. This high impact-resistant material does not dent, rust or corrode, and the lightweight design means you can easily manoeuvre it around your lawn. Because the clippings are finer than on a regular mower, you’ll be able to mow up to 30% farther before you have to empty the catcher bag. Again, this is designed with you, the user, in mind. The perfect cut has never been easier. Powered by the long-lasting Honda GCV190 engine. 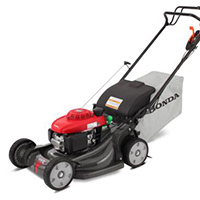 This premium residential engine is the lightest in its class, incorporating Honda’s Advanced Four-Stroke Technology. This means the HRX217 will run powerfully and quietly, with minimal fuel consumption – good for you and good for the environment. Mow-Safe Blade Brake technology, which stops the blade within three seconds of releasing the handle, allowing the engine to continue running. 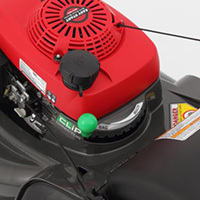 This technology allows you to step away from the mower to clear away hazards, empty the catcher or just take a quick break, without having to restart the engine. If you want a mower with all the bells and whistles, look no further.